The Impression Obsession team is showcasing new Valentine images that are available NOW! Be sure to visit the I.O. Blog today and tomorrow for links to the previews and ALL the challenge details. Be sure to leave a comment on our designers' posts throughout the week for a chance to win a $25 gift certificate from Impression Obsession! I had a lot of fun with this release, and I'm so happy to be able to share a few of the designs here - I hope you'll click over to the new release to see the rest! I colored up this little guy with Copics on Canva-Paper - isn't he so cute? He comes in cling/rubber and also in this clear set, with some mix-and-match sentiments. 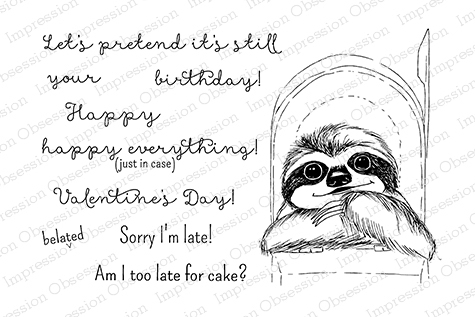 With those sentiments, this little sloth is great for Valentine cards, birthday cards, and everything in between - you can even be late on purpose! Here's a closer peek into the mailbox! A sloth! And so cute! Love the coloring and those sentiments are wonderful! TFS! He's so cute! I love him. Such a cute sloth but I'd still be scared if I found him in my mailbox.........your coloring is amazing as usual. The sentiment stamp set is perfect for so many occasions. This is the cutest set I've seen in a long time! Love it! Dina this is just too adorable. I might just have to get this because I am always late on cards. LOL! Hugs smile at this cutie!!! Could this be any cuter? I seriously doubt it! Look at that sweet, sweet face! So adorable. This card is just adorable with that happy little sloth! This makes me smile! What an adorable card! Such a cute image in a mailbox. Love the sentiments too. Adorable card! Your coloring is awesome! How cute is that image!!! And great sentiments, too!!! The Sloth is so cute, and I love the sentiments on this stamp set! So cute!! Love this little guy & your awesome design! Love the sloth bandit - looks easy to color too! Look at those eyes. Too cute. Thanks. How neat to include a sloth in the release. I'm looking forward to seeing the whole release! Look at that cute sloth! Cute card! What a great stamp. Your coloring is awesome. How fun with the sloth and I like your coloring. That sloth is slowly crawling his way into my heart. How cute!!! That little sloth is just adorable! Oh Dina, that sloth is soooo cute!! Lovely card! Cute card! I love adding buttins to my projects! I also like the polka dot paper! What cute face! Love your use of color. oh my that slot is the cutest! Love this card and stamp set. so cute. Who would think a sloth could be so cute. Very cute! Love the sentiment with the sloth too, haha! Very cute nail wraps too. Thanks for sharing. Snort ... my husband is a postal carrier, so I'm always on the lookout for new mail-themed stamps ... love the fun sloth & great sentiments. I'm not crazy about sloths...But this guy is pretty darn cute! Oh gosh. A little Seth! Pretty cute little sloth and your cards are adorable ! I never knew a sloth could be so adorable! Since I can be a bit of a sloth, okay I'll just say it, I procrastinate, I got a kick out of your card. I especially liked the "Let's pretend it's still your birthday" sentiment. Great card.